Peeling apples can be a tedious task that can be extremely time consuming, but thanks to the invention of the apple peeler this task no longer needs to be completed by hand. Many of the apple peelers available on the market today even come with the ability to core the fruit as well as slice it. This convenience ensures that the dishes and desserts that we create that utilize the robust, sweet flavor of the apple are smooth and delicious, without the potentially mealy texture of the peel. Of the many choices, which apple peelers simplify this job the most? Here is our list. The name Spiralizer has become synonymous with stylishly cut fruits and vegetables that take seconds to prepare. 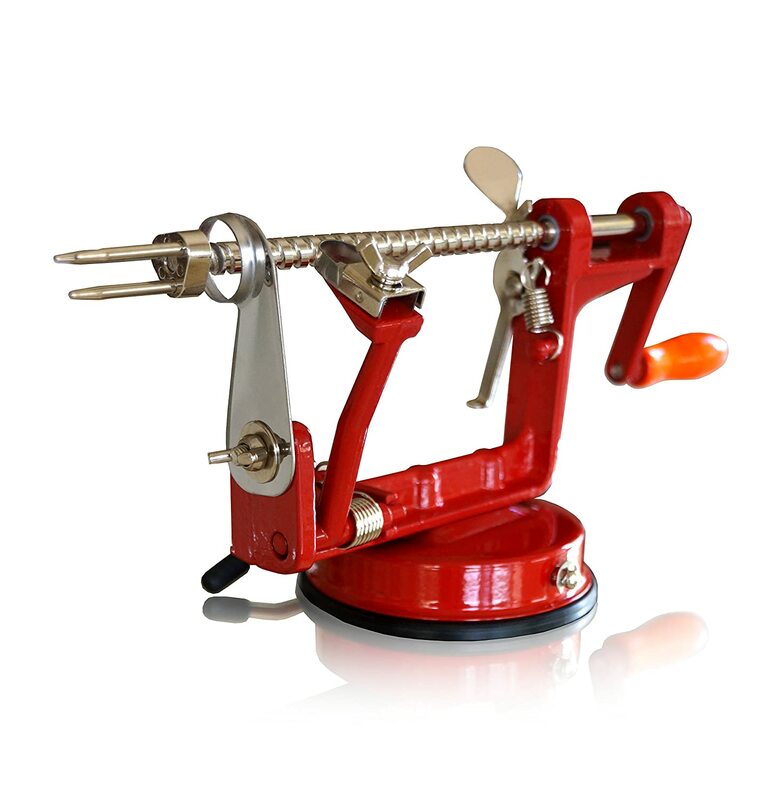 This apple peeler is our Gold Pick because it is simply a great and easily operated machine that makes slicing, coring, and peeling apples a simple proposition. Though it doesn’t have a massive amount of bells and whistles, its ability to make a process that is traditionally tedious, a cinch is why we hold it in such high regard. The resulting sliced apple is attractively peeled with little to no wasted fruit. The simple, almost workshop tool-like design is easy to store and fits in perfectly in nearly any kitchen. When you first look at this apple peeler, the first thing you notice is that it’s very vice-like in appearance. It’s mounted on a round base that houses a suction cup that’s designed to adhere to your counter space. The spiraling winding rod is made of shiny chrome and is pointed with three prongs that are designed to grasp the apple that is going to be peeled. At the other end of the rod is a user operated crank that is used to initiate the peeling and coring process. The device itself has an amazingly sturdy construction. The body of the device is comprised of heavy weight cast steel metal, a material that tends to stand the tests of time with little to no visible damage, even after frequent use and washing. The winding rod, which is the part that will be used most often, is composed of plated, rust proof chrome that’s spiraled for easy winding and cleaning. Finally, the sharp blades, which are composed of stainless steel, are fully removable for easy cleaning or replacement. This suction ensures that your peeling is securely locked and doesn’t slip; a situation that you don’t want considering that this item has very sharp blades. To lock it, simply apply pressure to the unit and pull down the lever that adjoins the base and this peeler becomes very hard to dislodge from a counter top or cutting board. This reliability is perfect for people with a need for heightened stability, such as seniors or those with arthritis. In one unit the Spiralizer has the ability to core, slice, and peel simultaneously. Simply pull out the winding rod, place the apple as deep onto the three pronged grip as is possible, and start winding. The circular blades in the center will core the apple as you peel, and the slicing blade will spiral cut the apple neatly. The spiral cutting blade can also be positioned to make cuts that are ring shaped. The result is a deliciously seedless, skinless apple that is neatly cut and ready to eat. Also, for recipes that actually require the peel, you can remove the peeling blade and simply slice and core your apples. In addition to apples, this device can also neatly core, slice, and peel potatoes making it a great option for your favorite spud dishes. Smaller potatoes peeled in this way make exceptional curly fries. This peeler weighs in at a little more than a pound and requires a little assembly when first purchased. It also comes with a prong cover to protect the hands from the sharp points when it’s not being used. The device also includes an eBook of interesting recipes for when you want to make something extra special from the apples you cut. On Amazon, you can get the Spiralizer Apple Peeler for around $19, and it comes in a bright red that goes well with any kitchen décor. Spiralizer also stands by this product. They have a 100 percent satisfaction policy which ensures that if you aren’t completely satisfied with the apple peeler, you can return it for the full cost of the device. Our second pick, similarly to our first packs a lot of punch for such a small device. Purelite kept simplicity at the heart of the design of this exceptional little apple peeler. Also similarly to the Gold Pick, the Silver Pick cores, slices, and of course, peels. Ease of operation is also a key property that Purelite instilled in this kitchen device. From start to finish anyone can peel, core, and cut an apple into easy to eat spiral slices in less than 30 seconds. The final result is an apple that is easily eaten, baked with, or used as a garnish with no mealy skin or inedible seeds to worry about. 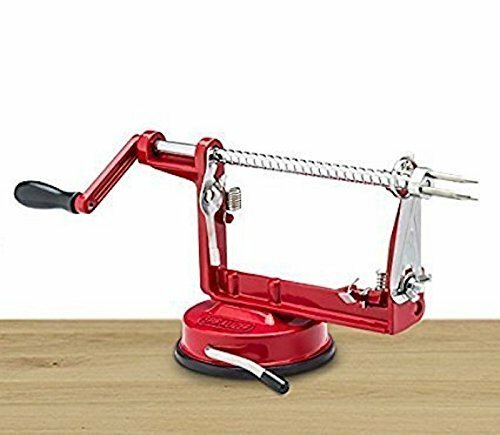 At first glance, this apple peeler looks similar to an old fashioned hand wringer. It has an orange colored wooden handle that you crank to operate the device. Attached to the crank is a chrome plated winding rod that is positioned above springs and the main chassis of the peeler. At the tip of this attachment is a three-pronged fork that is designed to grip the fruit that is being peeled. The body, which comes in a bright red, is question mark shaped and is composed of heavy weighted cast iron metal. The weight of this device is what really differentiates it from our Gold Pick, as this peeler is a lot heavier. Underneath the body is a round, disc shaped suction cup that when pressure is applied and the attached level is pushed, adheres fastidiously to any kitchen surface. Older style apple peelers use clamps that can damage your surfaces, with the powerful suction cups that come with these types of peelers, this type of damage is a thing of the past. In operation, the cranking motion spins the apple and propels it forward where a center cutting circle cores it. Simultaneously, a side blade peels the apple in a spiral yet thin cut. While both of these cuts are happening, an attached blade cuts deeply into the apple forming lattice like spiraled treats. The process is so simple and easy to do that, under proper supervision, even a child can make his/her own nutritious, sliced snacks. The resulting apple slices are 1/8 of an inch thick and perfect for snacking or baking. Purelite has built this peeler to last. Users have had this model for decades and these devices work just as well as they did when new. At a little over two pounds, the added weight on this model really adds to the overall stability. This coupled with the strong suction on the bottom makes peeling apples an easy activity for both young and old apple lovers. The chrome winding rod is strong and rust free and an absolute cinch to clean. For most jobs, simply running water over the parts will get the majority of apple bits off. Afterwards, simply wash with a wet rag and dry thoroughly. As with the Spiralizer, the Purelite can also make the slicing, coring, and peeling of delicious potatoes a simple matter. Mash potatoes boil much faster when cut into smaller pieces, so with the peeling done in such short time you can nearly cut half the time it takes to make this classic dish by using this peeler. Purelite’s apple peeler goes for about $25 on Amazon, and comes in a slightly dark red. As with Spiralizer, Purlite stands by this product. They have a similar 100 percent satisfaction policy that refunds the cost of the device if you aren’t completely satisfied with it. As our third pick, this peeler is noticeably different in design from the others. Clocking in at around 5 seconds per peel, this is one of the faster peelers on our list. Because of this blazing speed, the Starfrit really performs if you have a lot of apples to peel in one session. Made of transparent, yet sturdy plastic this apple peeler provides a unique visual experience when you start slicing your apples. As you turn the function knob, you can actually see the large internal gears working within the hard plastic shell, a feature which is a pretty fun feature to entertain children. The plastic that comprise the body of this peeler is tough enough to last for years of extended use. The lines of the device are very rounded and as a result of its transparency, the peeler matches nearly any kitchen décor. From a size perspective, the peeler measures about 7 x 10 x 24 inches, and weighs about a pound. Underneath the device are four suction cupped feet, which while not assisted by a lever like the Spiralizer or the Purelite, it adheres well to nearly any level kitchen surface. Positioned atop the base of the unit is a plastic arm that houses a three pronged grip. Apples are placed here and the cutting arm, which is positioned along the side of the unit, performs the cut. The spring loaded cutting arm also adapts well to nearly any sized apple, which includes irregularly shaped apples of any variety. This peeler also has great precision; it slices only the skin off of the apple and not any of the fruit itself. Due to this versatility, pears and other more irregular sized fruits and vegetables can be peeled as well as apples. To operate the peeler, you simply place the apple atop the prongs and crank the handle. The bladed arm adjusts to the fruit’s size automatically and in five seconds or less the apple will be without its skin. This peeler also has a lot of extras that come with the purchase. For added safety, included with the purchase of the Starfrit are a prong cover and a blade cover. To ensure lastingness, two additional blades for the peeler are also included. On top of this, a book of apple recipes comes with the purchase of this tool. A noteworthy difference between this and the previous peelers is that where the two metal peelers had simultaneous coring and slicing capabilities, this peeler exclusively peels apples. Luckily, Starfrit made sure that these options are well covered by additional in box pack-ins. With each peeler a separate corer and slicer are included in the packaging. For the corer, you simply place it in the center of the apple and apply pressure to remove the stems and the seeds. To slice your apple the included slicer is very effective. Simply place the spoked slicer above the apple and press down. As it cuts, it cores the apple and provides eight evenly cut apple slices. Of note is the fact that while this peeler is easy to clean, it is not dishwasher safe. On Amazon, the Starfrit costs a very reasonable $13. Traditional doesn’t always mean inferior. In times past, peeling an apple was achieved simply by shaving the fruit with a knife. As things progressed, what we now call the traditional apple/potato peeler came into heavy use. This device is dull on the outside, but has sharpened inner edges that peel the skin of the fruit or vegetable succinctly and efficiently. 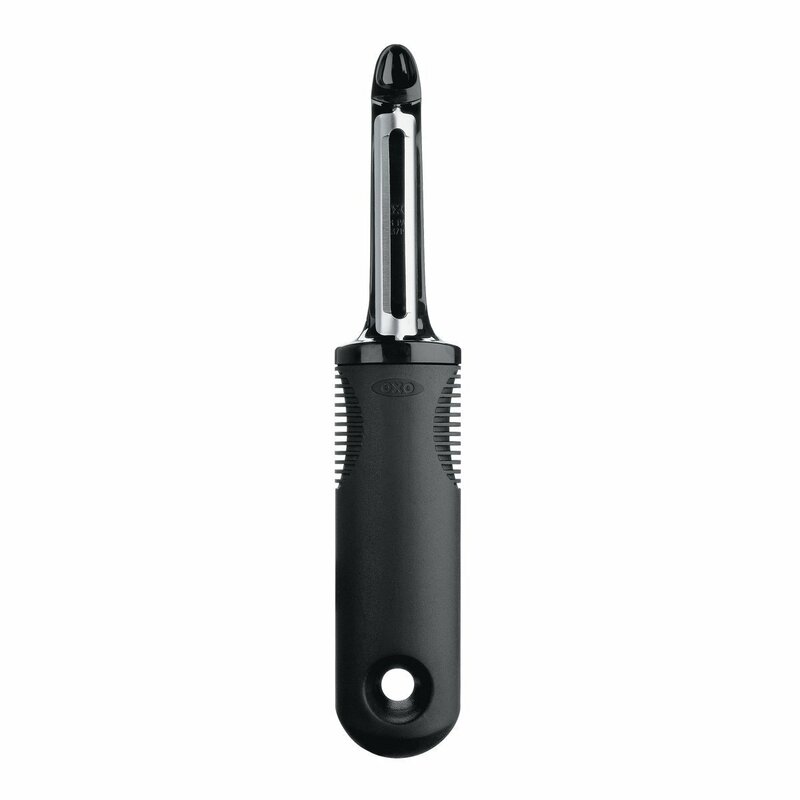 The OXO swivel peeler takes this now classic technology and brings it into the 21st century. While this type of peeler isn’t as high tech or as effortlessly utilized as the others on our list, none of the other peelers can boast the versatility of the traditional style of apple peeler. Anyone can use this type of peeler, and it can even be argued that this style is the safest when it comes to avoiding sharp edges. Also, since the blade is on the adjoining inside surfaces of the main assembly, this peeler makes for an exceptional tool for either righties of lefties. Whereas some of the previously mentioned peelers can only peel apples or potatoes, this style of peeler can peel any thin skinned fruit or vegetable imaginable. This is because the blade swivels to accommodate any size or shape differences that you might encounter while peeling your favorite fruit or vegetable. Insofar as functionality, this blade uses pure elbow grease to facilitate peeling. In other words, your physical effort directly yields palpable results as you slice the skin off of your food though this can become tiring if you have a lot to peel. Since the blade is so precise, very little of the fruit or veggie is lost when peeling. The soft handle is crafted for a more comfortable grip when peeling and the finned textures that are at the top of the handle make dropping the peeler nearly impossible even with oily or wet hands. Additionally, at the base of the peeler is a hole that is designed for any hooks you might have in the kitchen. This makes placing the peeler with other kitchen utensils an absolute non-issue. Above the blade assembly is a triangular indentation. This indentation is where this peeler has additional functionality: you can use this part for eyeing potatoes. The OXO peeler can easily be washed by hand and is dishwasher safe as well. The blade is not replaceable like some of the others that we’ve mentioned, but the whole assembly is easily replaceable because of its low cost. On Amazon, you can expect to spend less than $9 for this uniquely versatile, classic peeler. Before you decide which apple peeler best fits your needs, you may want to consider the functions you desire to have on the appliance. Obviously, you are looking for an apple peeler, but do you want the device to core the apples for you, which will effectively remove all of the seeds and the inedible core. You can also purchase apple peelers that come with a slicing device, which will make eating apples much more convenient. The only thing left to decide is if you want your apples to be spiraled as they are being peeled or sliced afterwards with a separate coring and slicing tool. Also, make sure to consider how much of the apple is removed with the peel; you do not want to be wasting the fruit simply because you are using a machine to peel it. No matter which apple peeler you decide to get, an important thing to consider is how stable the machine will be on the countertop. Some apple peelers have heavy duty suction to keep the peeler from slipping while it is preparing your apple for you, while others are not as luxurious when it comes to design. The main thing that needs to be taken into account in regards to stability is your safety. When apples are being peeled, do you have the chance to cut yourself? If you are using a manual hand peeler, is the grip sufficient enough to comfortable cut enough apples to make a delicious apple pie? Deciding between purchasing a manual apple peeler that you use with your own two hands and a machine apple peeler that you only need to place the apple on the machine is the next consideration. A manual may be great for someone who likes to be involved in the peeling of their apples, but it may not be the best for someone who gets pains and cramps in their hands. A corer and slicer take a bit of strength to push through an apple, so if you want a bit more ease of use, an apple peeler that does all of the work for you may suit you the best. The size of the blade in ease apple peeler will be one of the determining factors that determine how quickly each apple will be peeled. For some, peeling a bushel of apples in five minutes will not make that much difference than peeling them in ten, but for a person who bakes for a living, those few minutes saved add up to a lot of time each day. In addition, you will want a blade that is not going to be dull after one use. The longer the blade lasts, the more economical it becomes. Also, make sure to consider the blade changing process before settling on an apple peeler. You want to make sure that it can be changed with ease when the blade does eventually become dull. Cleaning up should always be a consideration when purchasing a new kitchen tool. Is the apple peeler you are considering dishwasher safe? Does it have small areas where the peel can be difficult to remove? Will the apple peeler slice the apple with clean cuts or will small apple pieces be left behind for you to clean up? Do you need to remove the blade to clean it, and will that take time you do not necessarily have? All of these questions are important considerations, because you are purchasing an apple peeler to save time. Of course you do not want cleaning your new apple peeler to reclaim that precious time. Imagine that you are baking three or four apple pies for a family gathering; who wants to peel several bushels of apples with a paring knife? No one wants to go through this long process. The solution is purchasing an apple peeler to make the job simpler. 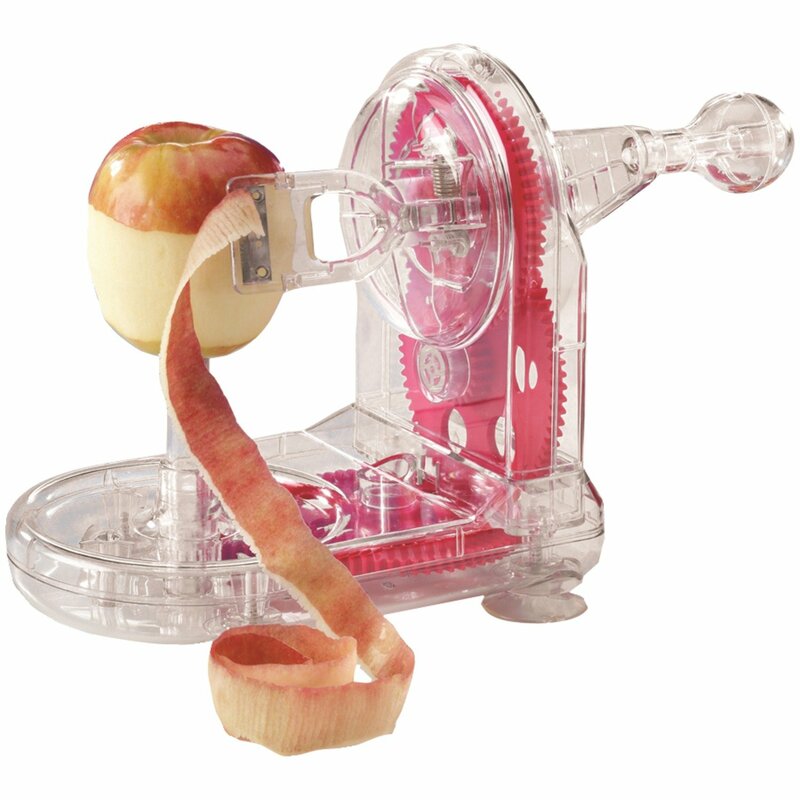 Each apple peeler offers its own unique features. Are your hands not as nimble or strong as they used to be? Then a peeler that has a winding arm and suction cups that adheres to your counter might be for you. Do you prefer wedge style slices over spiral cut apples? Then a Starfrit styles apple peeler with the included apple slicer might be better for your personal needs. Decide what you need from your apple peeler, and then choose the tool right that best suits your needs.